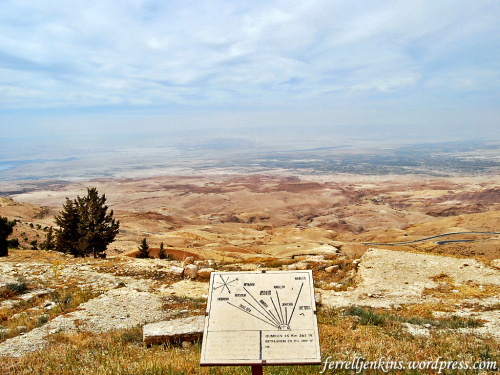 Our photo today was made on Mount Nebo in Jordan. The view is west across the northern end of the Dead Sea, the wilderness of Judea, and the central mountain ridge (or water-parting route). View of the Dead Sea, the wilderness of Judea, and the central mountain range from Mount Nebo in the Transjordanian Plateau. Photo by Ferrell Jenkins. Mount Nebo is the place from which Moses viewed the land that the LORD had promised to Abraham’s seed (Deuteronomy 34:1-8). 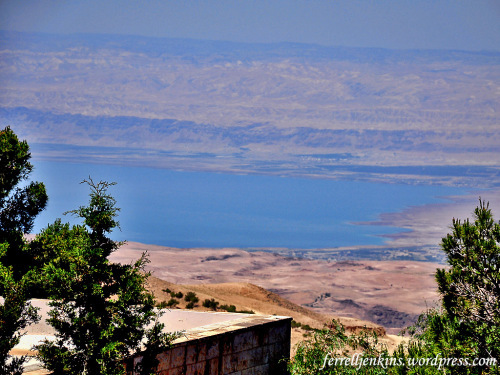 In the next photo the northern tip of the Dead Sea is visible on the left of the photo. This photo looks NW from Mount Nebo across the Jordan Valley (the plain of Moab) and toward the highlands of the promised land. View from Mount Nebo NW across the Jordan Valley. Photo by Ferrell Jenkins.